Today’s guest is Linda McMaken, a fellow author with Desert Breeze Publishing. She’s a sweetheart. I got to meet her and hang around a bit with her at Romantic Times Convention in April in Chicago. I think you’ll love her as much as I do. She has a new release which is book two in a three book series. 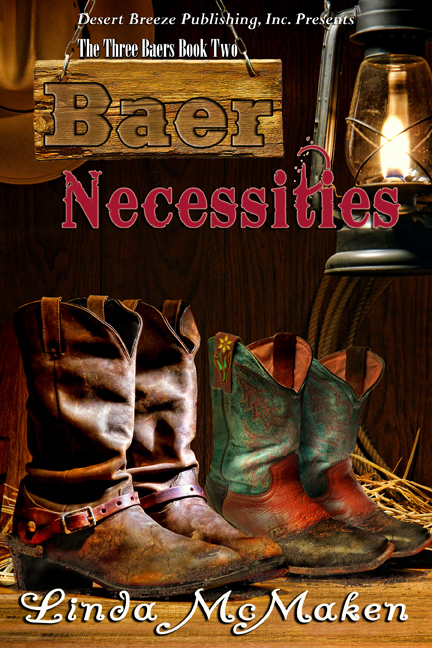 This one is called Baer Necessities. She’s sharing a blurb and excerpt with us today. She’s also running a contest on her blog that you may want to check out. While you’re in a checking mood, also check out the awesome boots on her cover! One of them will be just right. Connor Baer left the ranch to see the world. Jessie McIvey wasn’t far behind. He wanted no part of small town life, and she didn’t want a cowboy in her future. But sometimes the thing your heart wants the most, you’ve had all along. Two people left one small town to find what their hearts were searching for only to find everything they’d ever wanted right in their own backyard. Cowboys! What did he think she was, a roping calf? If he hadn’t held her hands, she would have made his family jewels sing for mercy. First, she is almost a deep fried human, then he straps her into a car with a seat belt that won’t unbuckle triggering a sequence of true crime stories playing in her head. When he let her loose, she would to commit a true crime on him. Threatening her with taking pictures and putting them in the paper. Cocky, overbearing cowboy. Oak would never have done anything like that. She pulled the seat belt harder, it wouldn’t budge. Connor flipped the wipers on high, slowing down. The Jeep treaded the water with gusto, but how would it handle the old trail on the outer reaches of the ranch? Even horses and cattle had a hard time navigating that area. Her breath caught deep in her lungs and refused to come out. She leaned forward forcing the air out. Passing out would not be attractive. The way he felt about her? Just how did he feel about her? His amazing kisses made her orgasmic. Connor’s touch was pure sizzle and, what was she thinking? Cowboy, ranch life! She couldn’t do it, didn’t want to do it. No. She folded her arms over her chest, trying to convince herself that she felt this way because she hadn’t had a man, a real man, kiss her like that in a long time. Who was she kidding? She’d never been kissed like that. Kissing Connor felt like all the passion in the universe landed between the two of them. Then he had to go all ‘cowboy’ and kidnap her. Hadn’t he learned anything being off the ranch? Thanks for coming by and commenting, Patty. I haven’t read these yet, but plan to. We heart you, both. Good job, Girls! Thanks Sadie and Sophie. I heart you both back! Nice cover and excerpt. Wishing you mega sales. Thanks or supporting my friend, Lavada. I love, love the look of old scruffy boots, too Laurie! It was a pleasure, Linda.